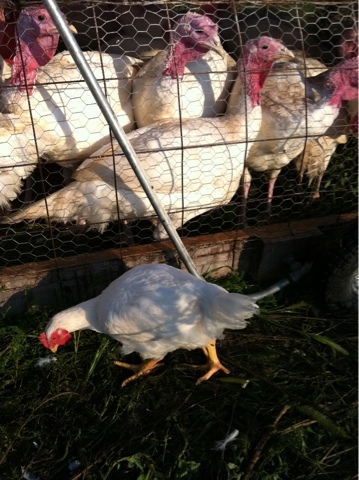 Last week at this time our fields were filled with 100+ turkeys and a number of chickens. Things are quiet now. Yesterday, Homer made an appearance on a local weather broadcast and pardoned 2 turkeys..a tom and a hen, to live on the farm. Those 2 are here, as are the laying hens, cattle and pigs. As the winter progresses and grass runs out the cattle will go to the butcher, and as the pigs grow out they will head out too. The laying hens will end up inside the hoophouse in late January/early February, as transporting water really is a problem when it us that cold out. So many people visited the farm and helped us this fall. We could never have finished the year with our marriage intact without help from Unjung, Eliza, Johanna, Jess, Matt, Will, Ari, Dan, Josh, Jerry, Claire, Ivette, Katie, and a host of others who offer such great support. We are thankful for each year and what we learn on the farm. Thankful that so many will eat what we grow, on Thanksgiving and all through the year. Thankful that we have the opportunity and health to grow all that we do..that we keep our strength of mind, body, spirit and soul by working and eating here. That we have the blessing of knowing other wonderful farmers and growers who produce such lovely food. And for our beloved family and friends who make this life possible. Homer always says none of us know how long we have, and that we should be enjoying ourselves. That each day should have time for work, thought and labor that must be completed today. And that each day also needs time for contemplation, reflection, dreaming, planning, music making, drawing, creating..that a mix of regular work along with creative outlet is what keeps us in the best shape. I'm off to get work done, preparations for our Thanksgiving meal, a walk around the farm on this beautiful fall day, collecting eggs and having a couple of visitors. Happy Thanksgiving.